Cigar Review: E.P. 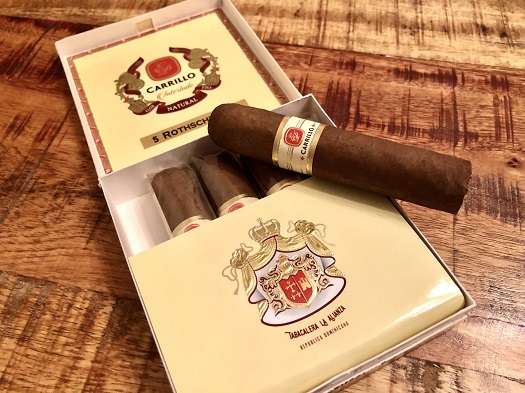 Carrillo Interlude Natural Rothschild Jr. I recently moved from the city to Oak Park, a close suburb of Chicago. The whole process, to say the least, has been stressful and time-consuming. Under normal circumstances, it’s hard enough to find time for a cigar when you’re working full-time and raising two small children (with a third on the way). When you add in the daunting task of unpacking about 75 million boxes… well, you can see where this is going. I know I’m not the only one with a challenging schedule. Chances are you, too, find it difficult to set aside the requisite time to thoroughly enjoy a fine cigar. Fortunately, if you need to pack a premium cigar experience into a short amount of time, cigar legend Ernesto Perez-Carrillo has your back. In 2016, he launched Interlude, a line of two different blends, each presented in two time-friendly formats: Carrillitos (4 x 38) and Rothschild Jr. (3.75 x 48). I smoked a handful of cigars in the Interlude Natural Rothschild Jr. format for this review. This cigar is neatly presented in a regal, compact five-pack that retails for $16.25 (or $3.25 per cigar). Unlike the Maduro version—which has a rustic, highly mottled wrapper that’s wrinkled, veiny, and rough around the edges—the Natural has a clean, dry surface. A standard guillotine cut reveals a smooth cold draw. At the foot, I find pre-light notes of honey and graham cracker. A cigar of this size needs to get off to a fast start. The Natural Rothschild Jr. does just that. The first few puffs are a medium-bodied burst of white pepper, dry oak, and cereals. The texture is bready. A bit of cinnamon spice helps to add balance. Into the midway point, while the cigar settles a bit in terms of body and spice, the core flavors remain the same. Not much changes in the finale except for an increase in intensity and heat. Throughout, the combustion properties are excellent. The burn line is straight, the smoke production high, and the draw is easy. Notably, the light gray ash holds really well off the foot; on average, I only had to ash once per cigar. As expected, the Interlude Natural Rothschild Jr. is a solid choice if you’re low on time but high on desire for a premium cigar experience. I’m not rating the Natural version quite as high as the Maduro—which, in my opinion, is more interesting from a flavor perspective—but this cigar still earns an admirable rating of three and a half stogies out of five. The text says the rating is 3 1/2 stogies, yet the graphic shows 4 stogies. Fixed. Thank you. Intended to be 3.5.